Let’s talk about first apartments for a second. They’re terrible, right? Well, maybe not anymore. The First Apartment Book from interior designer Kyle Schuneman and writer Heather Summerville conquers the age-old conundrum: How can you have an awesomely decorated place when you have no space, barely any furniture and even less money to spend? Sounds impossible, we know—but this magical book has 256 pages that prove otherwise (think space-saving ideas, design tricks and cool how-to projects). 1. Glue the pages of your book together by squiggling glue along the sides and gently pressing it into the pages with your fingers. Make sure not to glue the pages to the cover. Let dry completely, about 20 minutes. 2. Determine how wide of a space to cut for your succulent; you want at least 2 inches around the circumference of the roots to promote growth. Measure and trace the area you need to cut on the top page of your book. 3. Using your X-ACTO knife, carefully cut into the box you just drew. 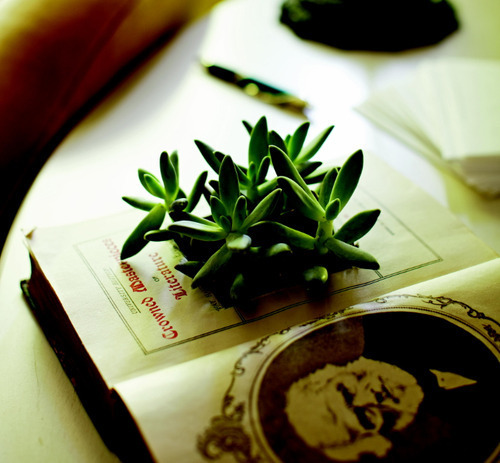 You will only be able to cut about 30 pages at a time, so you’ll need to repeat this step until you’ve created a hole deep enough for your succulent. 4. Line the box you just cut with your plastic Ziploc bag, making sure the bottom and sides are covered. 5. Arrange your succulent on top of the Ziploc bag. Be sure to transfer enough soil from the original planter, along with the plant itself. 6. 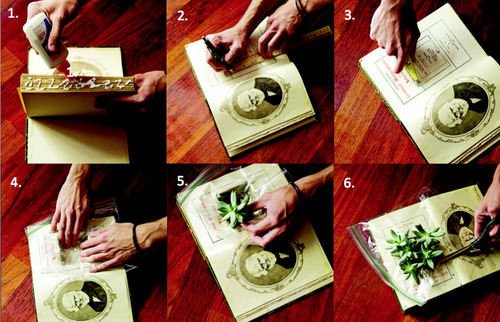 Using your scissors, trim the excess Ziploc bag around the edge of your succulent, leaving just enough of a plastic liner to keep water from running into the pages of the book when you water it. This entry was posted in Uncategorized and tagged diy, interior, madewell. Bookmark the permalink.